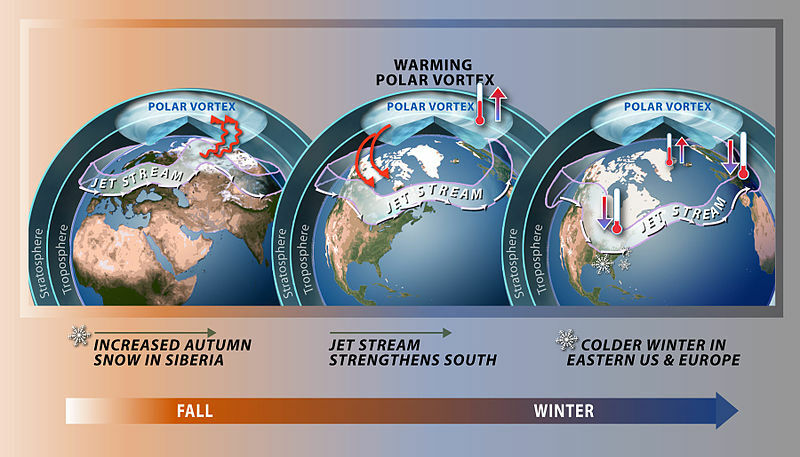 As the United States shivers under the Arctic Express, Polar Vortex, Polar Cyclone, Polar Low, Circumpolar Whirl or whatever name you call it (I just call it FREEZING!!!!) with snow, ice, and some of the most extreme cold conditions in decades, Americans will be happy to know that the Federal Emergency Management Agency (FEMA) has help available in the form of its extremely useful new disaster preparedness guide, Are You Ready? : An In-Depth Guide to Citizen Preparedness. Intended as both a reference source as well as a step-by-step manual, this easy-to-follow guide has been designed to help Americans “learn how to protect themselves and their families against all types of hazards”. The focus of the content is on how to develop, practice, and maintain emergency plans that reflect what must be done before, during, and after a disaster to protect people and their property. Also included is information on how to assemble a disaster supplies kit that contains the food, water, and other supplies in sufficient quantity for individuals and their families to survive following a disaster in the event they must rely on their own resources. The guide advises on planning before a disaster, responding during a disaster, and recovering after a disaster and is organized into the following sections: Why Prepare, Part 1 Basic Preparedness, Part 2 Natural Hazards, Part 3 Technological Hazards, Part 4 Terrorism, and Part 5 Recovering from Disaster. Each chapter has specific tips on preparation, what to do during the particular disaster, instructions for what to do afterwards, and where to go for more information, including links for free publications. c) Terrorism, including: General terrorist threats, Explosions, Biological Threats, Chemical Threats, Nuclear Blast, and Radiological Dispersion Device (RDD). 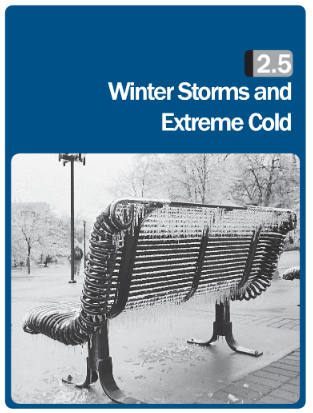 As I was concerned about the extreme cold, I turned to Part 2, Natural Hazards, Section 2.5 Winter Storms and Extreme Cold. In the preparation part, I found useful terminology such as the difference between sleet and freezing rain, protective measures and supplies to gather, tips on how to winterize my car (e.g., have you cleaned your car battery terminals and used gasoline additives to keep water out of your fuel lines?) and how to dress for the winter weather (did you know mittens are warmer than gloves?). During a winter storm, “Are you ready?” gives more advice, such as what to do if a blizzard traps you in the car and how to watch for signs of hypothermia. [Signs of hypothermia]… include uncontrollable shivering, memory loss, disorientation, incoherence, slurred speech, drowsiness, and apparent exhaustion. If symptoms of hypothermia are detected, get the victim to a warm location, remove wet clothing, warm the center of the body first, and give warm, non-alcoholic beverages if the victim is conscious. Get medical help as soon as possible. In addition to information on specific types of emergencies, the guide includes a number of other very useful resources. Assembling a Disaster Supplies Kit: A whole chapter is devoted to assembling a good general disaster supplies kit for multiple locations: home, work and vehicle. Practice Makes Perfect: Advice on how to practice and maintain your emergency plan is under Section 1.6. General Evacuation Guidelines: Tells what to do to prepare your home if you have to evacuate, such as utility shut-off and safety, reviewing and securing of insurance and vital records, and so on. Special Needs: Information on how to do disaster planning to accommodate someone with disabilities is included. Pets: Caring for pets in emergencies is not forgotten, either. FEMA Hazard Maps: It highlights how to get free hazard maps from FEMA in your area by accessing FEMA’s Hazard Mapping Portal. 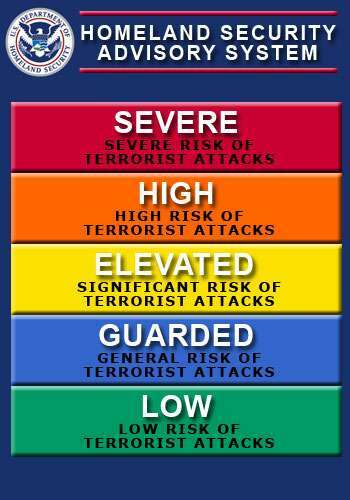 Warning Systems and Signals: The guide explains different national alert systems such as the Emergency Alert System (EAS) and National Oceanic & Atmospheric Administration (NOAA) Weather Radio (NWR), as well as the Homeland Security Advisory System with its Threat Conditions thermometer. a. there was an explosion in the building? b. you received a package in the mail that you considered suspicious? c. you received a telephone call that was a bomb threat? Mental Health Issues: Tips are included on how to recognize if children vs. adults may need crisis counseling or stress management assistance as well as how to ease disaster-related stress (such as attending memorial services). For children, guidelines are included by age range of common reactions to traumatic events, along with tips on how adults can reassure children after a disaster. Family Forms: The guide is customizable to you and your family with forms to fill out for your own emergency plans. Included is a form for you to use to fill out information as you collect it from your local authorities on possible hazards and emergencies in your community, the Risk Level and how to reduce your risk, along with a “Community and Other Plans” form to use to record answers from your local officials about your community’s disaster and emergency plans. Also included is a form to draw and to record your family’s specific evacuation route and another to record your Family Communications Plan. Checklists and Appendices: The guide also includes some handy appendices: Appendix A: Water Conservation Tips, Appendix B: Disaster Supplies Checklist, and the all-important Appendix C: Family Communications Plan. Preparedness Websites: One is a list of Disaster Public Education Websites from both the Federal Government such as FEMA’s own Ready.gov site (www.ready.gov), as well as non-Governmental sites, like the Institute for Business and Home Safety, www.ibhs.org. Disaster Recovery Assistance: Finally, advice and resources for getting disaster recovery assistance are covered in the Are You Ready? guide, too. How can I get a copy of “Are You Ready? : An In-Depth Guide to Citizen Preparedness”? Whether you live near an active volcano; in Tornado Alley or a Hurricane Zone; in wildfire, mudslide or flood-prone areas; or just want to be prepared for any emergency—natural or man-made—this guide will help you save the day! MULTIPLE COPIES: FEMA recommends having a completed guide for each location for your family members: home, work or school, and your vehicle(s). Fill out the customizable sections in each copy with your relevant family, workplace and community information. clicking here to browse all Disaster Preparedness publications. Digital: Find a PDF version on the FEMA site. Visit a Federal Depository Library: Search for it in a nearby Federal depository library. About the Author: Government Book Talk Editor Michele Bartram is Promotions Manager for GPO’s Publication and Information Sales Division in Washington, DC, and is responsible for online and offline marketing of the US Government Online Bookstore (http://bookstore.gpo.gov) and promoting Federal government content to the public. With the threat of an unusual “Frankenstorm” pre-Halloween hurricane possibly combined with a blizzard about to hit the East Coast in the next few days, I found myself with a dozen others at the store last night buying batteries, flashlights and bottled water. Next to me was a mother with two small children, one of whom asked loudly, “Mommy, why is everybody buying batteries and water?” I chuckled to myself as I looked at the frazzled adults and wondered how she’d explain what the fuss was about. With the rise in severe weather events in the United States and the related rise in media coverage about these creating anxiety in both young and old, parents and teachers have a lot of “‘splaining” to do to children. Fortunately, NOAA, the National Oceanic and Atmospheric Administration, in conjunction with FEMA (the Federal Emergency Management Association) and the American Red Cross, have prepared a terrific new booklet, Owlie Skywarn’s Weather Book, to explain different types of severe weather and how to prepare for each. 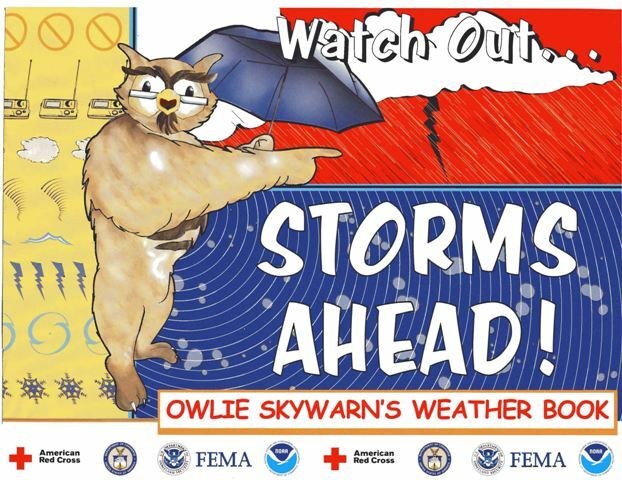 Although formatted to appeal to children, with “Owlie Skywarn” the cartoon weather owl introducing topics on most pages, this booklet is valuable for all ages. The book covers the gamut of severe weather, from hurricanes and tornadoes to lightning, floods and winter storms. For each type of weather, Owlie explains what it is, what kind of alerts or warnings may be issued and by whom, how to prepare in advance (if possible), and how to react while it is happening. For example, a great page illustrates a car safety kit every driver should have if he or she lives in places that get deep snow. Still other pages tell you where to go and how to protect yourself when a tornado warning is issued by NOAA’s National Weather Service, or over the Emergency Alert System, whether at home, school, office, store, outdoors or in a car. Sprinkled throughout are anecdotes from real people and towns that make the advice come alive. One is the story of a retired National Park Ranger who has been struck by lightning seven times and lived to tell the tale (albeit now with lightning rods all over his home). Yikes! Fascinating (and intimidating) weather facts are included like the fact that the most snow in one month in the United States actually fell in Tamarack, California, in 1911: a whopping 32.5 feet or 390 inches (or 10 meters for our non-US readers)! At the end of the book are quizzes and activities that can be used by a family at home or teachers in school with children to help ensure the lessons get through that severe weather is not to be played with. 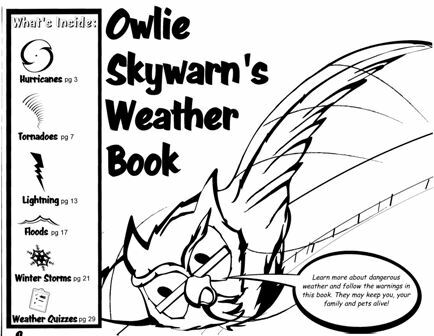 My recommendation to parents, teachers, well, really everyone is get a copy of Owlie Skywarn’s Weather Book, read it, prepare, and keep it with your other extreme weather supplies. These are lessons worth repeating often. I’ve got my copy with my spare batteries and my NOAA weather emergency radio. P.S. And to that mother in the flashlight and batteries aisle preparing for Hurricane Sandy: You will be happy to know that the answer to your daughter’s question about why everyone is buying batteries and water can be found on page 6. HOW DO I OBTAIN “Owlie Skywarn’s Weather Book”? Find this and other books about Weather and Climate on our new online bookstore.